FFA - FBI commands FAA to ground (censor) Florida Family Association aircraft with banner that stated AIG SPONSORS JIHAD TV. 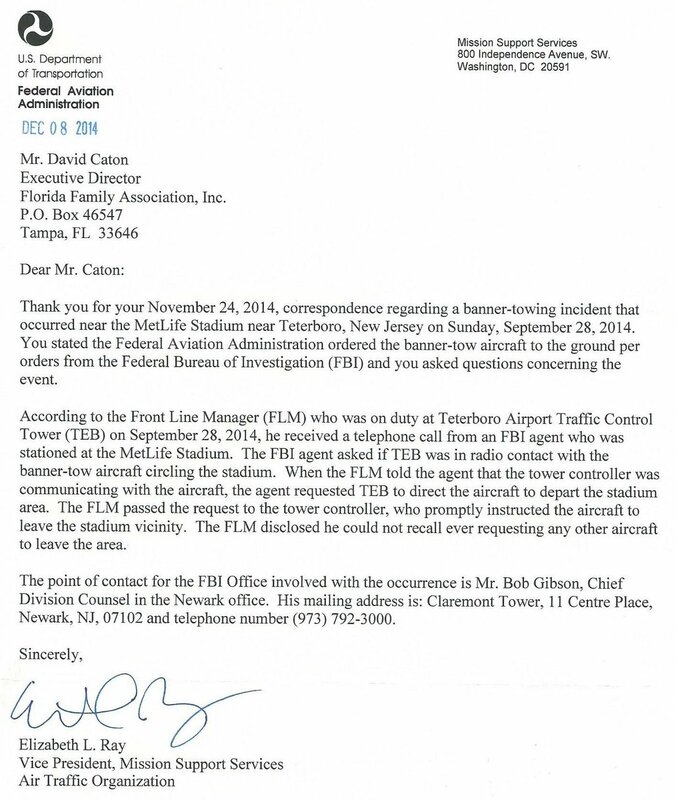 The Federal Aviation Authority (FAA), pursuant to FBI orders, grounded the aircraft that Florida Family Association paid to pull a banner around MetLife Stadium on September 28, 2014. The banner stated AIG SPONSORS JIHAD TV. The FAA lost the control tower audio recording of this act of censorship after receiving a Freedom Of Information Act request. However, the FAA provided a written account of the event in which they stated in part “The Front Line Manager (FLM) disclosed he could not recall ever requesting any other aircraft to leave the area.” The FBI has not provided a reason as to why their agency commanded the FAA to order the grounding of the aircraft. American International Group (AIG) is the llargest American company that is currently advertising on Al Jazeera America. Florida Family Association decided to hire aircrafts to pull banners to inform the public about AIG’s ardent support for Al Jazeera America after the company ignored thousands of emails from concerned consumers. This project was placed on hold to allow sufficient time for the FAA to respond to the grounding of this aircraft. Florida Family Association hired Aerial Messages, Inc. to fly a banner stating AIG SPONSORS JIHAD TV before the Detroit Lions vs. New York Jets game on Sunday, September 28, 2014 from 8:30 am to 12:30 pm at the MetLife Stadium in New York. The Los Angeles Times reported on August 15, 2013 that “some derisively label the network ‘Jihad TV.’"
FBI commands FAA to ground (censor) Florida Family Association aircraft with banner. Remy Colin, owner of Aerial Messages, Inc., informed Florida Family Association on September 29, 2014 that the FAA tower had ordered the aircraft carrying the AIG banner to land after it had been in the air approximately three hours. Mr. Colin stated that his Aerial Messages’ associate in New York informed him that an FBI agent outside of the jurisdiction of MetLife Stadium had instructed the FAA tower to order the aircraft to the land. Freedom of Information Act (FOIA) request made for recording of FAA controller conversation with pilot. Remy Colin filed a Freedom of Information Act request on September 30, 2014 for the audio recording of the conversation which took place on September 28, 2014 between the FAA tower and his pilot. Tessa Berry responded to Mr. Colin with an email on October 3, 2014 which stated in part: This letter acknowledges receipt of your FOIA request dated September 30, 2014, concerning NR8094D (94D) ATC recordings over the Met Life Stadium in New York from 10:00 AM to 10:45 AM Sunday the 28th of September 2014. Tessa Berry is FOIA Coordinator, FAA, ESA Administrative Services Group, Management Support Team. FAA lost the recording of the FAA control tower conversation with pilot. Stacy M. Thomas called Remy Colin the morning of November 21, 2014 to inform him that the recording of the FAA control tower conversation with Aerial Messages’ associate pilot from September 28, 2014 was missing. Stacy Thomas offered to have FAA personnel meet with the FAA Front Line Manager at the airport control tower and prepare a written account. Stacy M. Thomas is a FAA Management & Program Analyst, Administrative Services Group, Management Support Team, AJV-E52. The FAA formally replied by certified mail with letter dated December 23, 2014 which stated in part "A records search was conducted at Teterboro and Newark (EWR) Airport Traffic Control Towers. EWR does not have any information, therefore, they have no records responsive to your request." FBI NON-response. None of the three FBI officials responded to the letters from Florida Family Association. The FBI has provided no explanation for grounding the plane. The FBI mailed Florida Family Association a form letter dated January 9, 2015 stating that they have received a FOIPA from Florida Family Association and are "researching" the matter. Florida Family Association did not receive the written response from the FAA until December 16, 2014. The FBI was given four weeks to respond before making this act of censorship public. Florida Family Association flew the same style banner last year without incident. Florida Family Association hired Aerial Messages, Inc. to fly a banner stating PROCTER & GAMBLE SPONSORS JIHAD TV before the Green Bay vs. Cincinnati game on Sunday, September 22, 2013 from 9 am to 1 pm. Unlike AIG, Procter & Gamble stopped advertising on Al Jazeera America the week after the aircraft pulled the banner. The Federal Bureau of Investigation (FBI) has extended their censorship favoring Islamists beyond their agency to the private sector. In February 2012, the FBI cowered to the pressure from Islamist groups by removing 876 pages and 392 presentations from their educational resources because the materials were offensive to Islamists. In 2013, the FBI cowered again to Islamist groups by stopping their Most Wanted advertising campaign which helped the agency gain information regarding the whereabouts of dangerous terrorists. Now the FBI is censoring the private sector’s criticism of American corporate sponsorship of Islamist television. The FAA Front Line Manager’s (FLM) statement that “he could not recall ever requesting any other aircraft to leave the area” unmistakably means the federal government censored Florida Family Association. Did an AIG official ask an FBI official to ground the plane? Could the FBI also have deleted the audio recording of the conversation between the control tower and pilot given the FAA’s finger pointing letter? Florida Family Association tapes ten hours of programing on Al Jazeera America every day. The Florida Family Association office communicates with each advertiser no less than once per week. Top advertisers are strategically featured one at a time because there are so few of them. Two Hundred Thirty (230) companies have stopped advertising on Al Jazeera America. Florida Family Association has prepared an email for you to send to American International Group (AIG) officials. To send your email, please click the following link. This email will open in your email browser unlike other email campaigns on this web site. This is because AIG is blocking emails from Florida Family Association’s email delivery server. Please feel free to change the subject or message text if you wish. 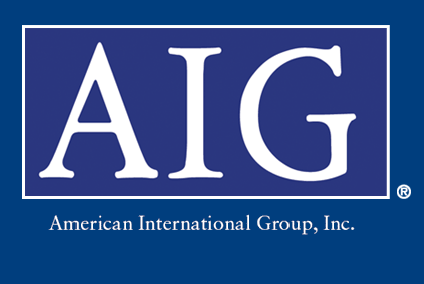 Click here to send email of concern to AIG officials. This email will open in your email browser unlike most email campaigns. This is because AIG is blocking emails from Florida Family Association’s email delivery server. If the above link does not open in your email browser or if the email is returned to you please prepare an email using the suggested email subject line, email content and four email addresses provided at the end of this article. Please stop advertising on Hamas-Muslim Brotherhood linked Al Jazeera America. I am very disappointed that American International Group is advertising on Al Jazeera America. Al Jazeera, whose leaders espouse hate for Israel, who showed disdain for Paris murder victims, is a news company that is owned by the non-democratic, monarch styled emirate of Qatar who allows wealthy citizens to financially support ISIS, supports the Muslim Brotherhood, backs the head of Hamas, espouses Islamic Sharia law and does not afford citizens freedom of the press.. Please stop supporting Al Jazeera America with United States consumer dollars.